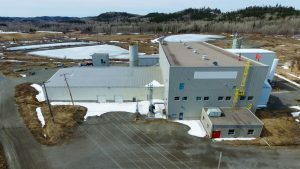 ONTARIO – Toronto-based First Cobalt Corp. has begun testing cobalt hydroxide material as feedstock for its refinery in Cobalt. SGS Canada has been retained to assess the suitability of different feed materials using the current refinery flowsheet. Last month the company said that restarting the refinery at 24 t/d feed rate and using the current flowsheet has a capital requirement of US$25.7 million (including a 30% contingency). The refinery could be operational in as little as 18 months. A final decision to restart the refinery has not been made. Historically, the refinery produced cobalt carbonate, nickel carbonate, and silver precipitate. To produce cobalt sulphate, the flowsheet must be modified to include a cobalt crystallization circuit. First Cobalt is exploring various sources of feed for the refinery, which could include cobalt concentrate from mining operations, cobalt hydroxide and recycled battery materials from North America.